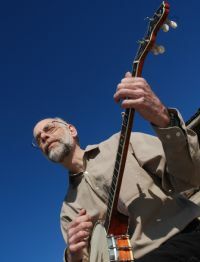 Latest Banjo Blog - tab for "Playin' Jane" from "My Lucky Stars"
Maple Ridge banjos are a hot item! arnie has 143 friends. View entire friends list. Banjo guys still with us: Chris Coole, Walt Koken, Frank Evans,Adam Hurt, Bob Carlin,Dan Gellert,Steve Arkin,Chris Quinn,Cathy Fink and some more plus a ghostly host of dead people I really admire. My interest in banjo playing began after attending The Mariposa Folk Festival and Fiddler's Green Folk Club in Toronto in the mid 1970's. I was so impressed with hearing Michael Cooney and Ola Belle Reed that I was determined to get a banjo and become a singer of folk songs. I acquired a Stewart MacDonald Eagle banjo put together from a kit, and Pete Seeger's instructional book and was quickly able to handle the frailing style of playing. Shortly after, I met Kurt Metzler who let me listen to his collection of recordings which opened up a new world of traditional music to my ears. I listened to music from the 1920's and 30's from the golden age of recorded stringband and early country music. Uncle Dave Macon, Charlie Poole and The North Carolina Ramblers, The Carter Family, The Delmore Brothers were among those included, as well as revivalists The New Lost City Ramblers- who were a major influence on my playing, and who were current exponents of this music they called "Old Time Music". The following year banjo in hand, while waiting in line for tickets to The Mariposa Festival, some strangers with fiddles asked me if I'd play a tune with them. I sheepishly said that I was just a beginner and only knew two fiddle tunes, but I got out the banjo and my very first jam session was in the making. The realization that an instant connection could be made with total strangers through music had a profound effect on me. I started compiling a repertoire of fiddle tunes on the banjo in a more complex downpicking clawhammer style. I attended other festivals that specialized in "Old Time Music" and thus became a part of a vast community of great players and wonderful people. I hung out with Pete and Ellen Vigour from Virginia who were, and still are inspirational to my musical development. The live presence of the music I was hearing was exciting and intoxicating, and gradually became absorbed into my very soul. I started performing with Kurt Metzler at various venues as "The Potatoe Pancakes" and we landed a job singing songs and playing instrumental music for a consecutive seven year stint in a pub. I met my wife Kathy Reid within the music community and we began performing and playing music for country and square dances, clubs and festivals and music camps. We organized a weekly folk music performance with the goal of including good local performer's participation, and we named our duo "Ragged But Right". I met Chris Coole who quickly accumulated a repertoire of fiddle tunes on the banjo and together with Kathy on guitar and myself on fiddle, and later on Erynn Marshall on fiddle as well, performed as "The Extraordinary Stringband" and played southern style music for dances. It was during our late night practices that Chris and I discovered that we had each composed some interesting banjo tunes of our own. We decided to record some of these along with some traditional music and the CD ř Strings Attached With No Backing" was born. After encouraging feedback from the recording, we decided to do occasional club performances together. Volume 2 was recorded 3 years later. The Banjo Special featuring various styles of banjo music with Chris Coole, Chris Quinn, and Brian Taheny and myself is our latest recording project along with banjo extravaganza concerts. Our newest recording THE BANJO SPECIAL is available now!